Review: Take a moment to admire the cover. Go on. Cute, isn’t it? 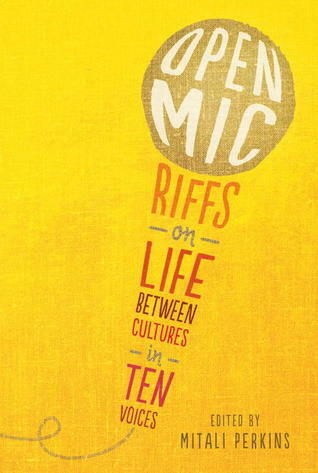 Open Mic is an anthology with a colorful mix of stories in different mediums. Gene Luen Yang discusses the problematic casting of Avatar: The Last Airbender movie using comics to tell his story. G. Neri lays out a cultural map of Berlin using a blend of humor and free verse poetry to describe a multi-cultural family in a place not quite ready for diversity. Debbie Rigaud creates a snapshot of the relationship between Simone and her great-aunt Ma Tante. One story in particular stood out to me: Mitali Perkins’ story gave me a glimpse of her teenage life. The story centers around Mitali and her two sisters playing the Game of Guys and being perfectly comfortable with who they were. Recognizing Mitali in her own story, I realized how personal each of the stories in Open Mic were. The autobiographical thread running through the short stories and poems is a story in itself. The story told is, like the title says, a story of life between cultures. My main complaint is that of length. Only ten stories? The last work, Naomi Shihab Nye’s gorgeous poem “Lexicon,” left me wishing Open Mic would continue on. The value in this sort of anthology is that it’s so rare — an anthology written about and by people who have actually experienced life between cultures. These are voices that need to be heard. Wouldn’t it be great if, instead of ten voices, there were hundreds? Thousands? Here’s hoping many more such anthologies will follow. Recommendation: Get it soon or borrow it from the library when it comes out. I’m definitely eager to read this one.